Director and Writer: Bob Byington. Stars: Jason Schwartzman, Tunde Adebimpe, Olympia Dukakis, and Eleanore Pienta. A few years removed away from the height of its notoriety, most film critics and movie lovers at large can agree that mumblecore wasn't all that bad. One of the tropes of the genre is the lack of actual of direction of the plot and conventional story arcs. On paper, having a "day in the life" of a character or group of people sounds like an interesting way of doing character study, but there's a reason why we go to the movies, and that's for good storytelling. 7 CHINESE BROTHERS is a movie full of charming performances and humor that unfortunately falls flat when you realize very little happens. 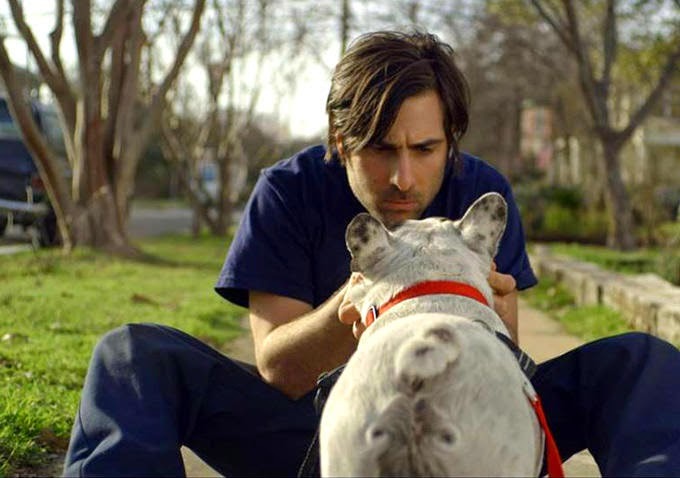 Jason Schwartzman plays Larry, a rather awkward loser, who can't seem to keep a job for very long. He drinks constantly, he's very confrontational, but he's got a cute French bulldog, Arrow, so that's something. He visits his grandmother at her hospital, even though he's trying to hit her up for money, and he's friends with Major Norwood, who takes care of his grandma. Let's be clear here: Larry is an alcoholic, albeit a semi-functioning one. There is very little to like about him, but his relationship with the very few in his life seems to be the only redeeming quality about him. When he gets a job at a Quick Lube, it seems that he might start becoming a productive member of society. What follows is a scene of Larry going through his days without much happening. He pisses off people, and sometimes that creates momentary and slightly humorous results. But that's about it. The climax of the movie is pretty obvious. What's strange is that this movie is too serious to be a comedy and dealing with a serious subject like alcoholism. You could almost make the point that the movie's lack of plot is a way of showing how alcoholism can make someone's life feel like a disjointed set of events. The thing is, Jason Schwartzman is doing a fine job as Larry, and it makes one wish he could be inserted in a better movie. TV on the Radio lead singer, Tunde Adebimp, returns to acting as Norwood, and he is perfectly adequate in the role but there's nothing outstanding. 7 CHINESE BROTHERS is a movie with very little to do or say, and it's kind of hard to say much about it. It's a drama that exists and seemingly only tells part of a story, but doesn't give us anything substantial.